St. Francis of Assisi was a poor little man who astounded and inspired the Church by taking the gospel literally—not in a narrow fundamentalist sense, but by actually following all that Jesus said and did, joyfully, without limit and without a mite of self-importance. From the cross in the neglected field-chapel of San Damiano, Christ told him, “Francis, go out and build up my house, for it is nearly falling down.” Francis became the totally poor and humble workman. He must have suspected a deeper meaning to “build up my house.” But he would have been content to be for the rest of his life the poor “nothing” man actually putting brick on brick in abandoned chapels. He gave up every material thing he had, piling even his clothes before his earthly father (who was demanding restitution for Francis’ “gifts” to the poor) so that he would be totally free to say, “Our Father in heaven.” He was, for a time, considered to be a religious “nut,” begging from door to door when he could not get money for his work, bringing sadness or disgust to the hearts of his former friends, ridicule from the unthinking. But genuineness will tell. A few people began to realize that this man was actually trying to be Christian. He really believed what Jesus said: “Announce the kingdom! Possess no gold or silver or copper in your purses, no traveling bag, no sandals, no staff” (see Luke 9:1-3). Francis’ first rule for his followers was a collection of texts from the Gospels. He had no idea of founding an order, but once it began he protected it and accepted all the legal structures needed to support it. His devotion and loyalty to the Church were absolute and highly exemplary at a time when various movements of reform tended to break the Church’s unity. He was torn between a life devoted entirely to prayer and a life of active preaching of the Good News. He decided in favor of the latter, but always returned to solitude when he could. He wanted to be a missionary in Syria or in Africa, but was prevented by shipwreck and illness in both cases. He did try to convert the sultan of Egypt during the Fifth Crusade. On his deathbed, he said over and over again the last addition to his Canticle of the Sun, “Be praised, O Lord, for our Sister Death.” He sang Psalm 141, and at the end asked his superior to have his clothes removed when the last hour came and for permission to expire lying naked on the earth, in imitation of his Lord. 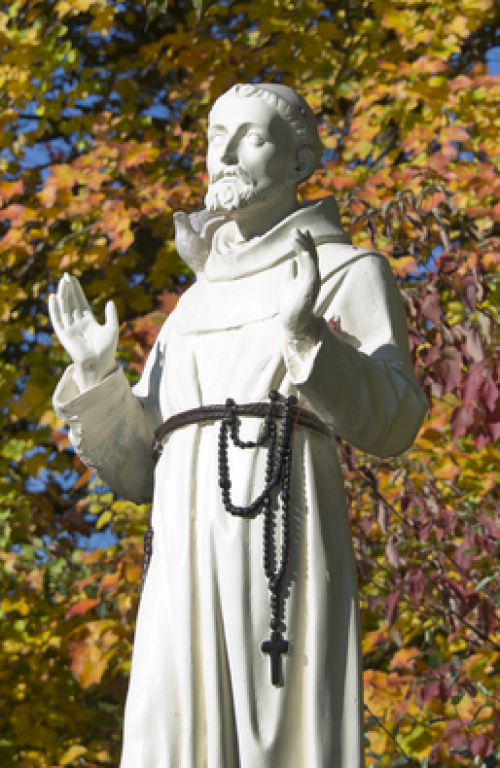 October 4th is the feast day of St. Francis, lover of all creation.